I am on the waiting list at my local library for the new bestseller Death Comes To Pemberley, a thrilling romp with the Pride and Prejudice characters. It was recently penned by the 91-year-old detective novelist P.D. James. I can only hope I am that active and creative at 91! The novel is set at Pemberley 6 years after the marriage of Elizabeth and Darcy, two of Jane Austen’s best-loved characters from her novel Pride and Prejudice. You can just never get too much of P&P. Over the years there have been various tv and movie adaptations of the novel, each with its own engaging cast members. 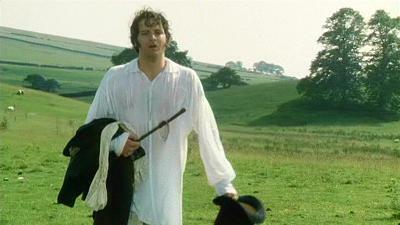 And of course, Mr. Darcy is one of the greatest male romance heroes of all times, and a popular choice to focus on. Elliot Cowan as Mr. Darcy 2008. These were 4 very different Mr. Darcy’s on film… Peter Cushing in a 1952 TV version (can’t find a photo of him, sorry), Colin Firth in 1995, Matthew Macfayden in 2005 and Elliot Cowan in 2008 (in “Lost in Austen”, a 4 part British TV series). My favorite is the classic 6 hour BBC mini-series featuring Firth. The story unfolds beautifully with the expansive time of the series, the costumes are appropriately lovely, and Colin Firth just hit the mark for me as the perfect Darcy. Colin Firth in "one of the most unforgettable moments in British TV history." (The Guardian) From the BBC television series "Pride & Prejudice". If you get a chance, rent all you can and compare. Meanwhile I’m waiting for my email from the library to see what P.D. James has to say. Can’t tell you how many times I have watched P&P. I liked the BBC series as well. Will rent it again.. I loved Kiera Knightly as Elizabeth. She was terriffic. Nothing better than to pour a cuppa tea and pull out the dvd. The part when she gets to Pemberley is always my favorite no matter which version.